Lorenzo is the project manager of a construction project. Major milestone is due to be achieved in next month. He predicts the chance of increasing of materials cost is 40% due to political problems in his country and lead to project delay with impact $60,000. On the other hands, if risk does not happen, project can be achieved the milestone and the customer will award $12,000 as a bonus. What is the EMV of this risk? Lorenzo is the project manager of a construction project. Major milestone is due to be achieved in next month. He predicts the chance of project delay due to lack of manpower is 40% caused by long weekend holidays. 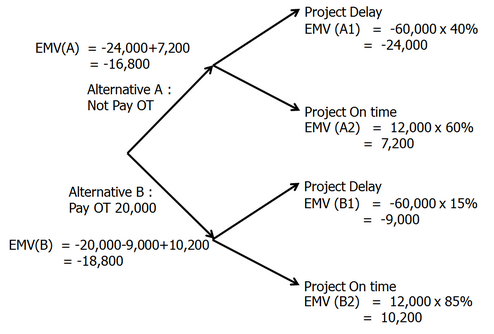 If he pays $20,000 in OT cost, the chance of project delay will be reduced to 15%. Project delay will impact $60,000. On the other hands, if project can be achieved the milestone, the customer will award $12,000 as a bonus. What is the best decision for his project ?